Once again it was nice to see the very good support for our Two Wood Singles (meter stick) knockout competition which began on 24th and was completed Sunday 26th January. This is played as the title suggests with two woods and played to twenty-one ends. The winner being, the first to twenty-one shots within the meter stick, or with the most shots on completion of twenty-one ends. The winner was John Fitzgerald who beat Wayne Roberts in a game that had everything in bowling skill sets. John playing his normal steady way and did not disappoint us, with some superb shots, which at times was equalled by Wayne. However this was John’s day, not letting Wayne get in front throughout the game. Wayne met Eileen Phoenix, our new Lady Captain in their semi-final. This was a very exciting game. Eileen led all the way spoiling Wayne’s prospective winning shots, time and time again. However, on the twentieth end when Eileen was one shot ahead, Wayne had his day by taking both shots on the last end. A big disappointment for Eileen, but well done to both players. 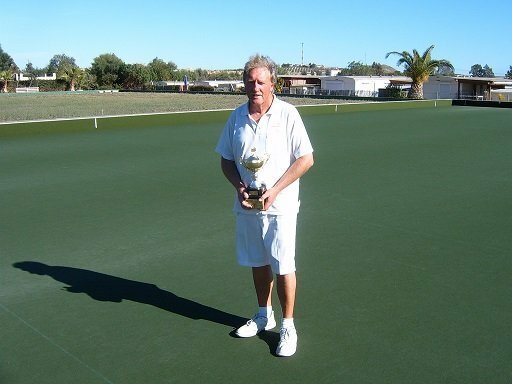 In the other semi-final, John met Viv Sykes who did very well getting to this situation, having not played a lot of bowls over the past months. The first end Viv took both shots and her glory for the day. John then in his usual punishing way, although some quality shots from Viv, prevented her from going ahead throughout the game.